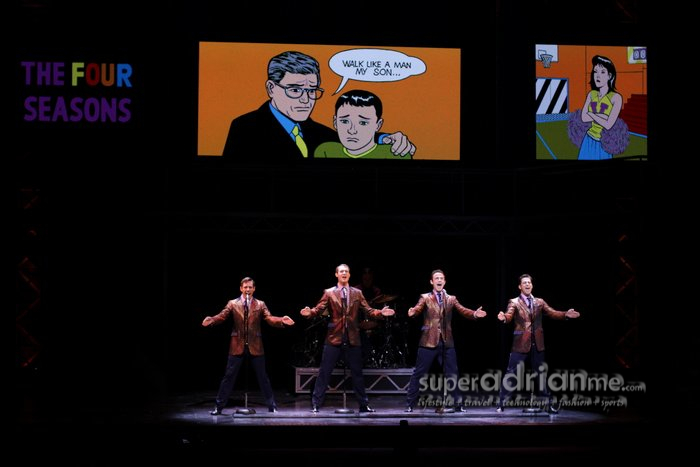 21 November 2012, Singapore – Go back in time with Frankie Valli and The Four Seasons with the Jersey Boys musical which debut last night at Sands Theatre, MasterCard Theatres at Marina Bay Sands with a full house Gala Premiere. Based on the true story of Frankie Valli & The Four Seasons, it is a musical packed with smash hits by the band in the 60s & 70s. 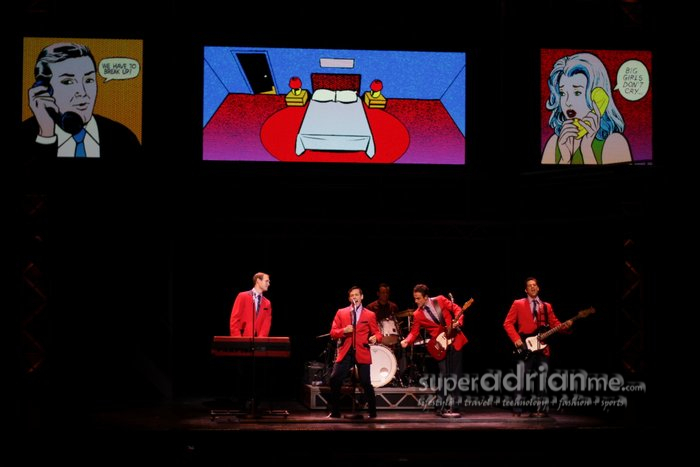 If you can hum to tunes like “Can’t Take My Eyes Off You“, “Beggin” and “Big Girls Don’t Cry“, this musical will give you all those memory flashbacks from the good old days, and if this was a concert, I bet you will sing them out loud. If you cannot hum those tunes now, during the musical you will find them somewhat familiar as you would heard remixes of them before. Even we did not know some of these popular tunes were originally from Frankie Valli & The Four Seasons. The smash hits are weaved nicely into the storyboard while relating to the true life story of Frankie Valli & The Four Seasons. Simple but beautifully engineered stage setup that comes with their very own broadcast station. 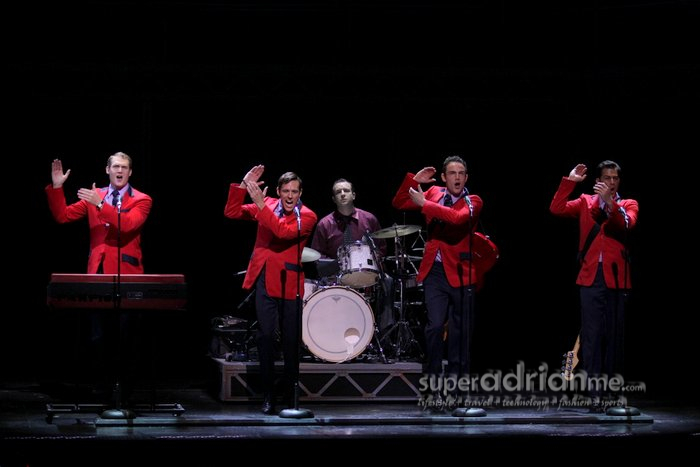 Fantastic cast with the lead, Grant Almirall, an almost perfect score on hitting the high notes throughout the show for his role as Frankie Valli who is known for this unusually powerful falsetto voice. 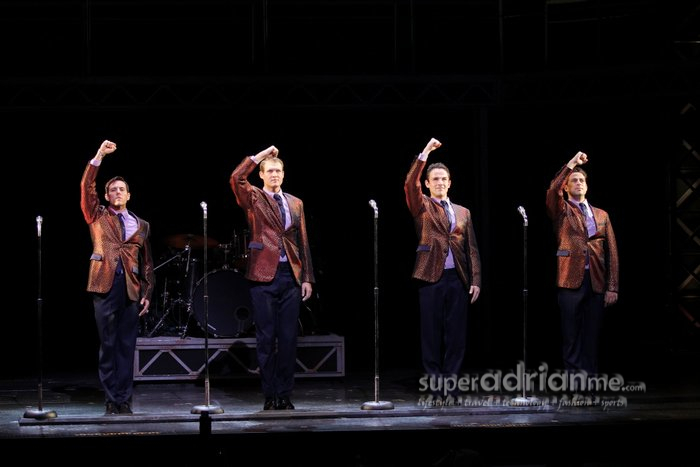 Genuine inspiring and motivating, Jersey Boys shows the pain and sorrows behind fame and fortune, while opportunities are given to the ones that tried hard enough to reach their goals. 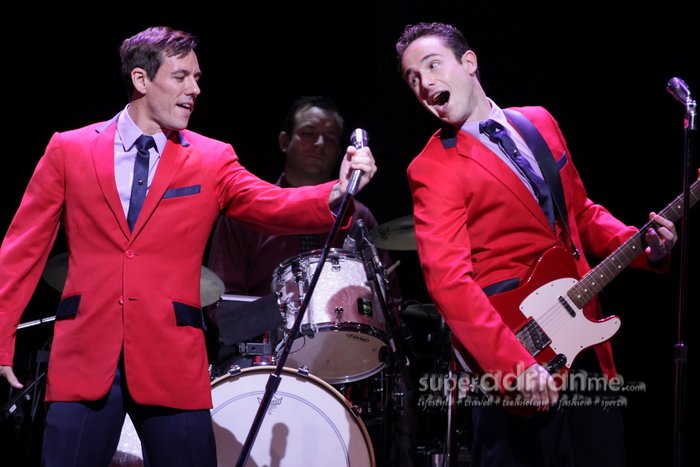 *Disclaimer: Jersey Boys may not be suitable for kids as the dialogues contain a lot of expletives. Thanks for the pix – lets me relive these memorable song/dance acts during the performance that I caught last weekend at Marina Bay Sands. Loved the choreography and singing; the acting was great, but the story alas – it was bland to a point of being boring at times – I was even stifling a yawn or two! Pity – they could have added more songs and should have prolonged the group singing act at the end of the show to about 15 minnutes to include more upbeat songs – I just didn’t get enough of their songs & dancing ..
Didn’t think Jersey Boys sat well with the Singaporean spectators beccause of the excessive f*^k word throughout and the way-too-heavy New Jersey accent (can be difficult to catch at times) – perhaps that’s why this musical is ending 5 weeks ahead of its original schedule. This act should be tweaked/improved upon if they want success with Asian audiences..